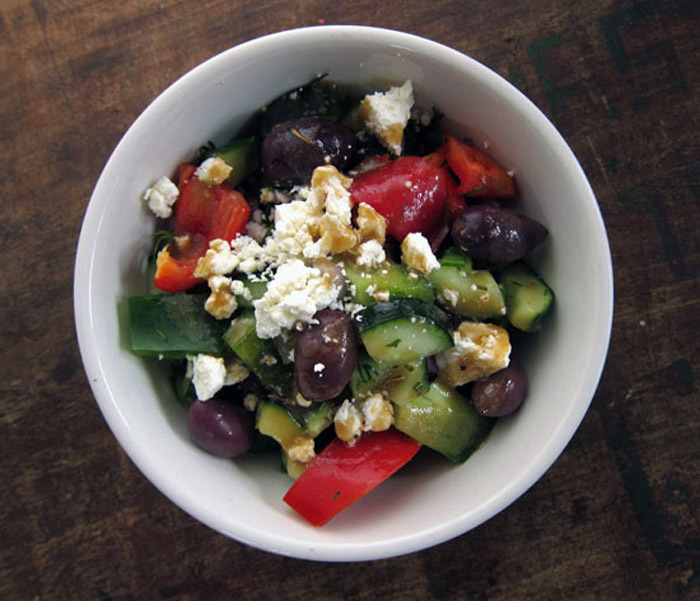 I'm not sure if I can call this salad a real honest-to-goodness Greek salad. For one, there's no tomatoes. It's winter here and I just can't justify using tasteless tomatoes. Truthfully, I'm not really a true raw tomato fan. So there's that. The other thing is that I add a few more ingredients than just cucumbers, peppers, onion, feta and olives. In fact, anything that looks good and has some crunch is a viable option when it comes to this big salad. I even scrape out the slimy seeds from the cucumber to keep things in tip top shape. No slime balls here. Crunch is an important factor because this is what I call a Keeper Salad. I make a big batch of the stuff on Sunday and I keep it in a sealed glass container in the fridge for the rest of the week. I dip into it daily, adding colour and flavour to my lunches on these drab winter days. 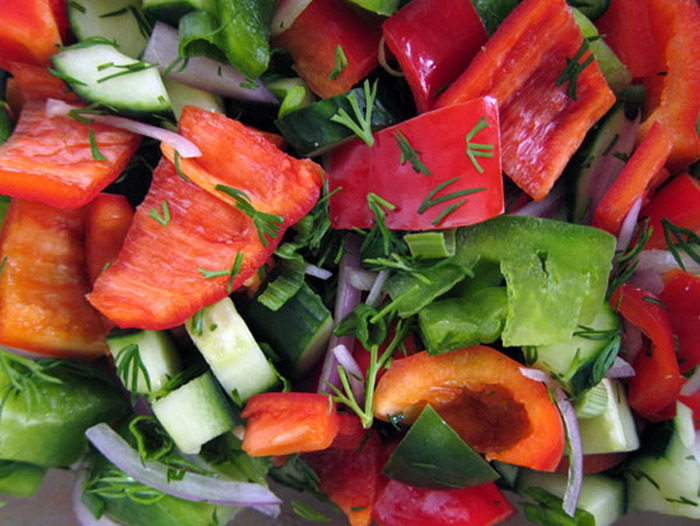 The key to a keeper salad, besides choosing the right crunchy vegetables, is to separate the ingredients away from the dressing. No soggy salads here. First I mix up the vinaigrette and I make sure that I use ingredients that will keep for a good couple of weeks in the fridge. There's no raw garlic or fresh herbs to turn slimy and black. Instead, I cheat and use garlic powder, onion salt and dried herbs. It's a fantastic dressing that I keep in a small mason jar in the fridge. Once the dressing is made and the vegetables are chopped, it's smooth sailing from here on out. Only when my salad container is nearing empty, I'll restock and make a new salad batch. If you wanted to add in chickpeas, cooked faro or chopped chicken or tofu, I'd add those to your plate, along with the cheese and olives, rather than the big salad. Separation is key, remember? 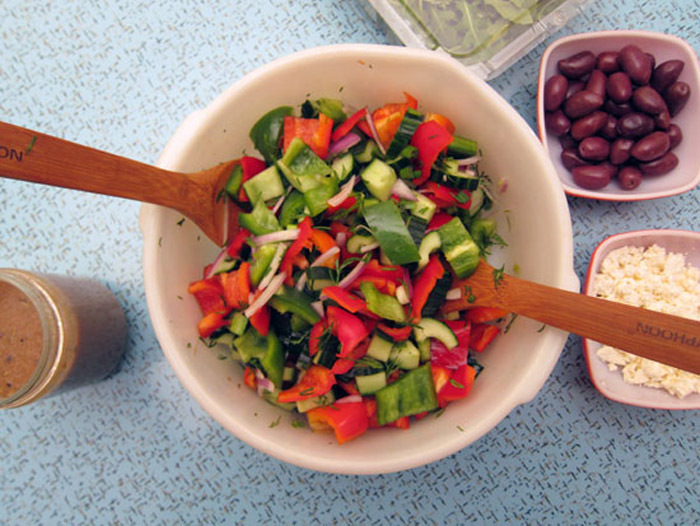 So enjoy your crunchy Greek-style salad all week long. In a small jar combine all ingredients, shake well and taste. Adjust seasoning to your own preference. The dressing should keep in your fridge for about 2 weeks. Substitute the vegetables as you see fit - I skipped the carrots + fennel this time around, but they do make wonderful additions. Crunchy is key to a salad that will last all week long. I was worried about adding fresh dill to the "big bowl" but it stayed fresh for 4 days with no wilting or slime. 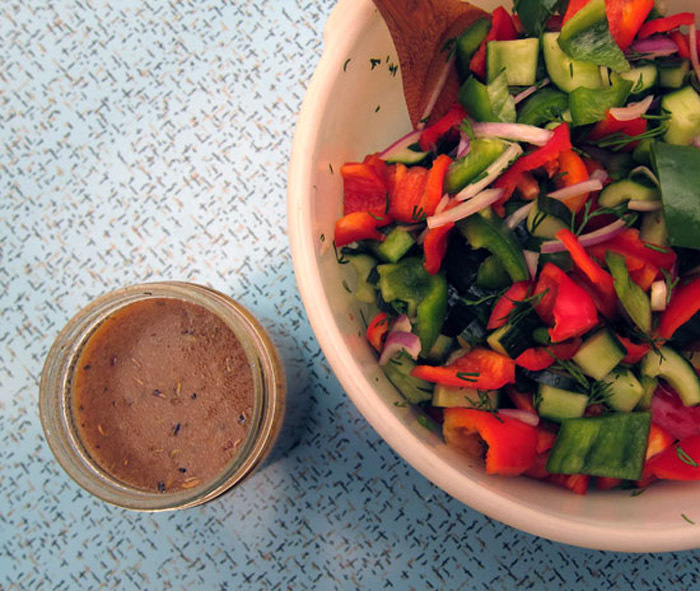 Toss everything from the peppers to the dill in a large bowl and then transfer to a lidded storage container. I like those glass-lock ones. Keeps in the fridge for 4-5 days. 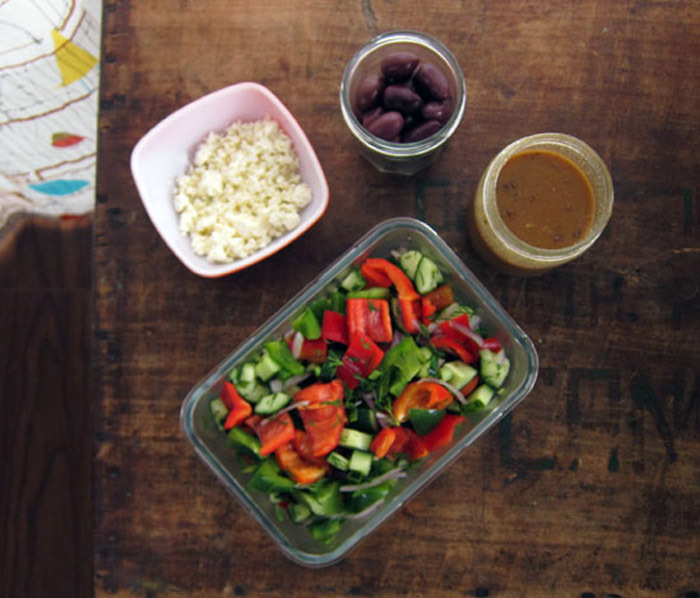 When ready to serve, dish out the salad into individual plates and toss with some arugula, any protein or grains, and then sprinkle feta a few olives over top. Drizzle with your vinaigrette. 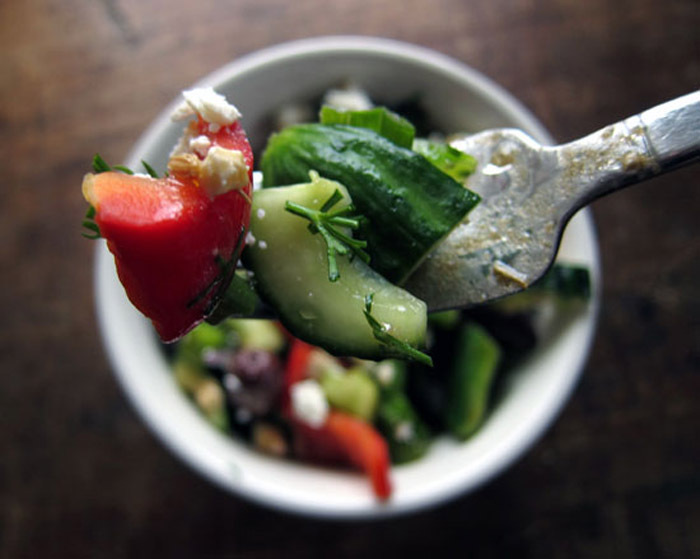 i love greek salad and feta cheese! YUM! I love this idea of the keeper salad. Definitely going to try it. This is an easy and simple recipe. It would be great for entertaining since you can prepare everything a few days in advance and then just toss and serve when you need. Can't wait to try it.